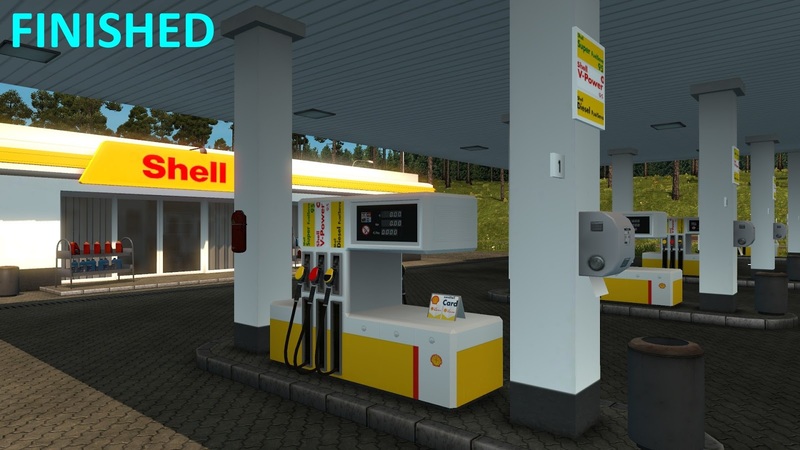 ETS 2 Real European Gas Stations Reloaded has been updated to version 1.33! *Updated for compatibility with 1.33.x game version. NOTE: Nothing changed for gas stations in the new version. This update only for compatibility 1.33.x game version. 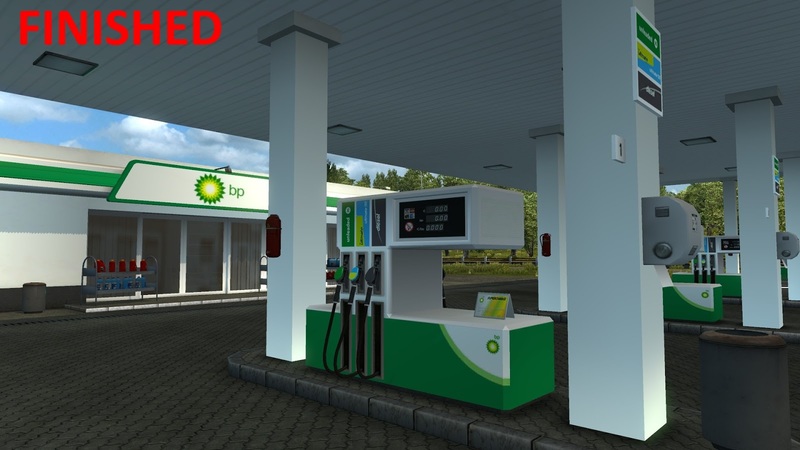 This mod replaces all original gas stations in ETS2. 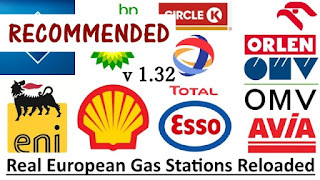 Shell, Total, BP, Esso, Eni (formerly Agip), Orlen, Aral, AVIA, OMV, and Circle K (formerly Statoil Fuel & Retail). Mod is created from ground up and is not just simple recolour of main texture and slaping companies' logos. There are many small details done (it will be more in the feature), not done in any other gas station mod before. 1) We are trying to be as close as possible to reality but it's impossible without messing with 3D models and we won't do that for the various reasons. 2) There are many colour and design variations by the same brand so we had to choose the one most aplicable to the game because of 1). 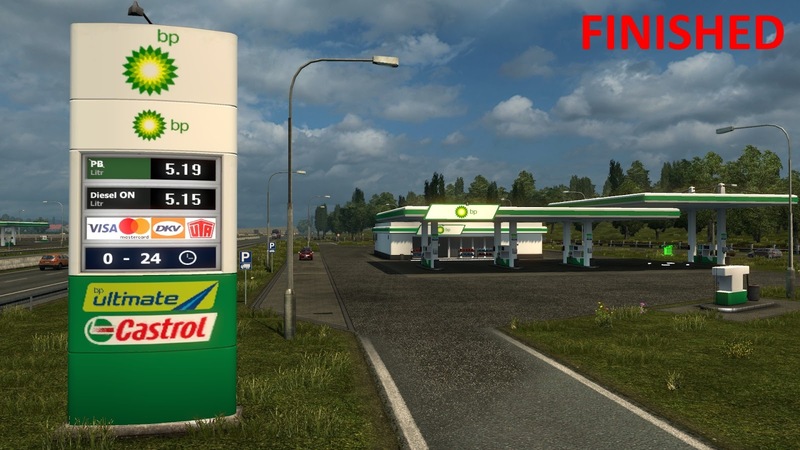 *In Scandinavia DLC is only possible to have proper logo of gas station and price stand. 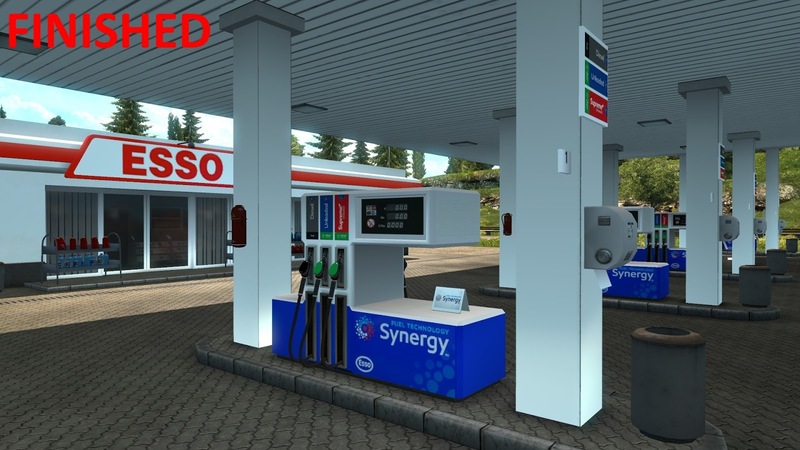 It is impossible to have properly colored gas stations like in base game expect the small one. It's hard coded that way so when you see wrong colours we modders have nothing with it. ***Read above. The new hybrid company/gas station is called Ini :-). Some textures can be changed, but the most work has to be done in Blender. 1) This mod has to have higher priority than any map mod. 2) If map mod doesn't change 3D models of gas stations then there is no problem. 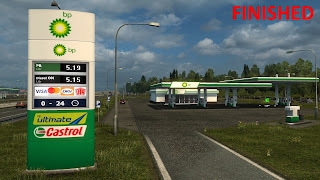 There are multiply reports that mod works fine with ProMods map. I can personally confirm that mod works flawlessly with RusMap. If you don't use map mod(s), priority of mod is completely irrelevant i.e. it can be placed even the last in Mod Manager. There is no guarantee that mod properly works in OpenGL mode i.e. showing only white textures. Sorry :-/. After a month of break, mod is being updated and should be finished up to 8-10th of October (excluding 3D modeling which is not guaranteed). Please don‘t reupload mod outside Steam Workshop! Uploading mod as non-creator/owner and earning money of it will be threated as copyright infringement. Azirus as original creator of REGS v1 and v2 but he doesn't update it any more hence this mod. This mod uses his Scandinavia DLC Circle K small gas station model, Total medium gas station (which we can't find in the map) and some minor textures. Thank you for your work. 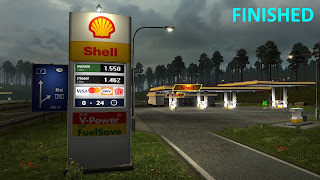 The Shell and Shell V-Power brands are owned by Royal Dutch Shell plc. The BP, Aral and Castrol brands are owned by BP PLC. 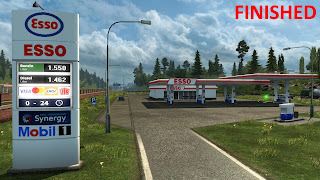 The Esso, Mobil 1 and Fuel Technology Synergy brands are owned by Exxon Mobil Corp. The Q8 brand is owned by Kuwait Petroleum Corporation. The Eni brand is owned by Eni SpA. The Total brand is owned by Total SA. The Orlen, verva and stop cafe brands are owned by Polski Koncern Naftowy Orlen SA. The AVIA brand is owned by AVIA International. The OMV brand is owned by OMV AG. The Circle K brand is owned by Alimentation Couche-Tard Inc.
owned by their respective owners. base mod?  This post was created with the original link of the creator. You can download it from Steam Workshop.